WARREN, Ohio — Tucked away behind the dilapidated carcass of the once-sprawling Copperweld Steel Co. sits a bright, blue building that hums with activity and opportunity. The juxtaposition couldn’t be any starker. Gone are the days when this complex along Mahoning Avenue in Champion Township employed thousands. Yet during its waning days in 1988, Copperweld entered into a partnership with Japanese manufacturer Daido Steel and formed a new venture – Ohio Star Forge – a business that initially was limited to the production of bearings mostly for the automotive industry. “The nucleus of the company was two machines and the bearing business,” says William Orbach, president and CEO of Ohio Star Forge. The successor of Copperweld, CSC Ltd., closed its doors and liquidated 16 years ago, while a more recent attempt to resurrect steelmaking at the site under Warren Steel Holdings also fell short. But over the last 30 years, Ohio Star Forge, now a wholly owned subsidy of Daido, continues to thrive and expand its plant at the site, a result of continued investment and diversification in its manufacturing processes and product line. “A decision was made to grow,” says Orbach, who reports about $40 million has been invested into the operation since it started. Still, the company had to take a closer look at its business model and recognize where its inefficiencies lay and opportunities exist. That meant diversification into other markets and developing the capability to forge components for automotive applications such as transmission systems, and enter into nonautomotive markets such as the oil and gas industry. 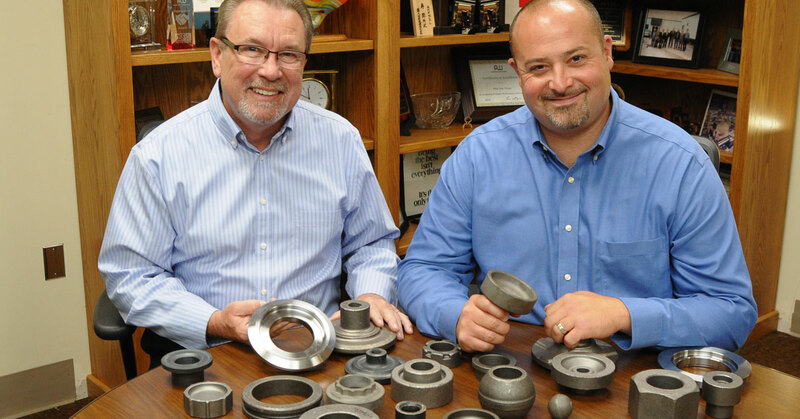 William Orbach, president and CEO, and Carl Paglia, director of sales, show bearing and transmission components that Ohio Star Forge produces. This scrutiny last year led the company to plot out an entirely new course of action and add 15,000 square feet to its existing building to house a new machining division. “We went to Daido, requested a review market study and then the addition of the equipment to do the machining,” Orbach says. He emphasizes that over the last 10 years, customers of Ohio Star Forge were asking for value added machining services to help them better source finished components. Moreover, the company’s competition was starting to enter this market, and Ohio Star Forge had to strike while the market was still hot. “We designed this building so the wall can be knocked out,” Orbach says as he enters a brightly lit building with two lines of CNC machining equipment. An additional five machining cells are planned for the building, the first of which should be installed next year. The expansion meant that Ohio Star Forge could attract new customers – most of which are Tier 1 suppliers to the automotive industry. The new machining operation was funded by a $4.5 million investment by the company and enables Ohio Star Forge to further process the products manufactured by its forging division. Essentially, the machining process refines the components produced by the forging lines, turning a rough metallic part into a smooth, gleaming and nicely finished product that can be shipped to the customer, Lambert says. The customer then will perform some additional work – grinding, for example – and “super finish” the part before it is assembled into a bearing system or drive train. Orbach, the CEO, says should business increase at the projected pace, future plans call for the construction of two similar-size buildings to the west that could house another 10 or 11 machining cells. The Hatebur forge allows Ohio Star Forge to produce components at a rapid clip. 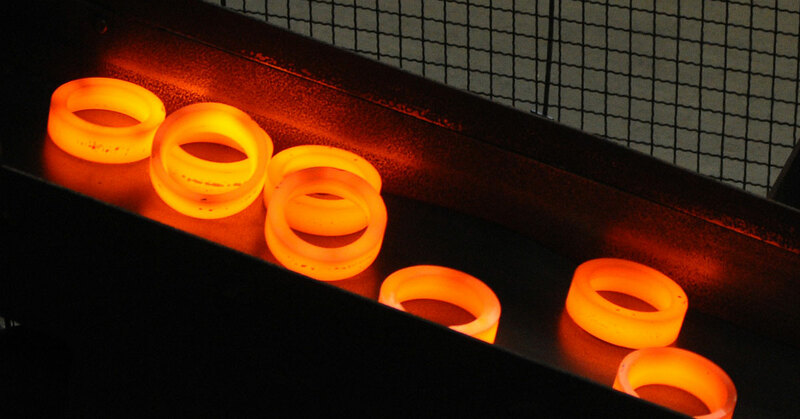 Simplified, forging is a manufacturing process that uses pressure and heat to produce a part. Bar steel is shipped to Ohio Star Forge where it is heated and fed into the forging systems, where the metal is shaped and cut. Ohio Star Forge primarily supplies the North American market – including Canada and Mexico – Orbach says. Although business is strong, there are uncertainties presented by the growing trade rift as a result of steel tariffs imposed by the Trump administration. In June, a 25% tariff was imposed on steel imported from the Far East, Canada and Mexico, and the European Union. This has led to rising material costs for the company. Ohio Star Forge processes roughly 40,000 tons of steel each year. On a warm August day, the plant is teeming with action as glowing hot bearing components spill one after the other off a Hatebur forge and into a bin. Orbach reflects that the company has borne the same trials as other metals manufacturing ventures across the Mahoning Valley over the last 30 years. But it has endured because of wise management and dedication by its employees.